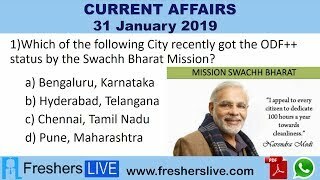 Current Affairs 31st January 2019: Instantly obtain Latest Current Affairs 31st January 2019 with all essential info, Be the first to know all the Current affairs 31st January 2019 top news, Major Issues, Current happenings, Important events in National as well as International level with clear explanation. For all competitive exams and Interviews, equip yourself with the Latest Current Affairs 31st January 2019 granted here. Sangrur MP Bhagwant Mann was reappointed chief of the Aam Aadmi Party’s Punjab unit. Mr.Mann had resigned from the post last year in protest against AAP convener and Delhi CM Arvind Kejriwal’s apology to former SAD Minister Bikram Singh Majithia. Mr.Mann is an Indian politician. In May 2014, he became the MP for Sangrur constituency, Punjab. He is also a professional comedian who performs skits in the Punjabi language. The World Leprosy Eradication Day is celebrated on 30th January 2019. It is to stress the need for eradicating the disease. It also brings to light the discrimination and stigma that people suffer from society every day. The theme for World Leprosy Day is ‘ending discrimination, stigma, and prejudice’. Leprosy, also known as Hansen’s disease is a highly contagious infection caused by the bacterium Mycobacterium leprae. Union Finance Minister Piyush Goyal received the Carnot prize for his work towards sustainable energy solutions from University of Pennsylvania in New Delhi. This award rewards the works done by Piyush Goyal to reform the electricity sector and extended access to electricity to 18,000 villages. Indian Council of Agricultural Research (ICAR) launched the National Agricultural Higher Education Project (NAHEP) to attract talent and strengthen higher agricultural education in the country. It is inaugurated at the fourth Convention of 2-day “Agrivision-2019” organized by Vidyarthi Kalyan Nyas in Pusa, New Delhi. This project (Rs 1100 crore) is to be funded by the World Bank and the Indian Government on a 50:50 basis. According to report,India ranked 78 out of 180 countries with a score of 41. Denmark topped the index, with 88 points. China ranked 87 and Pakistan ranked 117 It was followed by New Zealand, with 87 points and Finland with 85. Sudan was the worst with a score of 10 points, while Somalia and Syria followed it up with 13 points each. Overall, more than two-thirds of the 180 countries scored below 50 in the index, with an average score of only 43.